2.2 million are treated and released from an emergency department. Emergency personnel typically determine the severity of a brain injury by using an assessment called the Glasgow Coma Scale (GCS). The terms Mild Brain Injury, Moderate Brain Injury, and Severe Brain Injury are used to describe the level of initial injury in relation to the neurological severity caused to the brain. 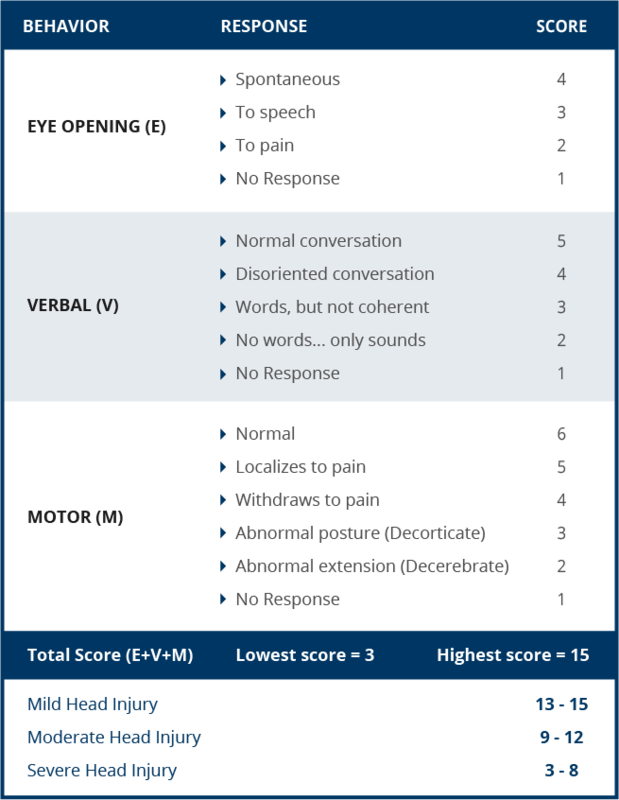 There may be no correlation between the initial Glasgow Coma Scale score and the initial level of brain injury and a person’s short or long term recovery, or functional abilities. Keep in mind that there is nothing “Mild” about a brain injury—the term “Mild” Brain injury is used to describe a level of neurological injury. Any injury to the brain is a real and serious medical condition. There is additional information about mild brain injury on our mild brain injury page. The scale comprises three tests: eye, verbal and motor responses. The three values separately as well as their sum are considered. The lowest possible GCS (the sum) is 3 (deep coma or death), while the highest is 15 (fully awake person). A GCS score of 13-15 is considered a “mild” injury; a score of 9-12 is considered a moderate injury; and 8 or below is considered a severe brain injury. This information is not intended to be a substitute for medical advice or examination. A person with a suspected brain injury should contact a physician immediately, go to the emergency room, or call 911 in the case of an emergency. Symptoms of mild TBI can be temporary. The majority of people with mild TBI recover, though the timetable for recovery can vary significantly from person to person. 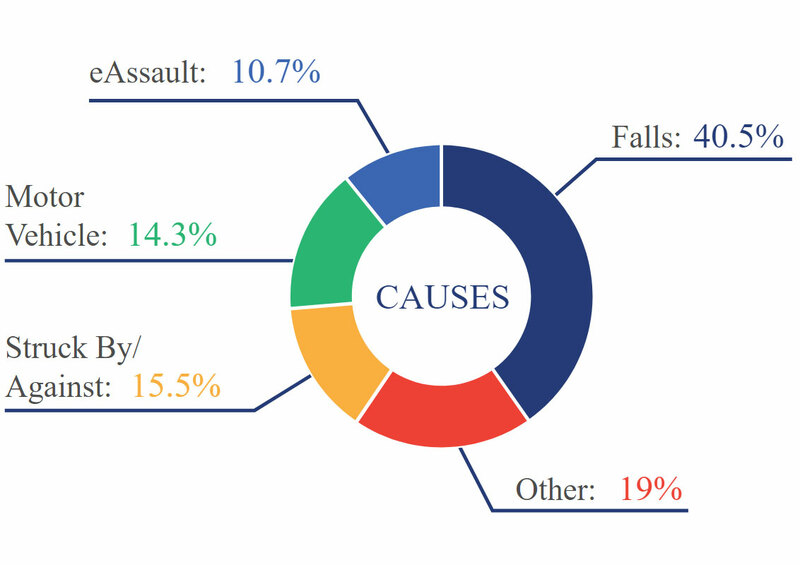 Source: Defense and Veterans Head Injury Program & Brain Injury Association. Brain Injury and You. 1996. Rus is one of the Best! Rus was very professional and informative throughout my whole situation. He advised me what to do and what not to do during my whole case. He is very friendly and knowledgeable with practicing. He always kept me in the loop and always had updates for me. I would recommend him to anyone in a bind with insurance companies, he helped me out and I’m sure he can do the same for you. After a disabled man died during a routine procedure at an outpatient clinic, his family wanted answers. Because of a loophole in the law, the case had little chance of success. Mr. D’Amore took the case anyway. Ultimately, he was able to provide the family with the truth about what happened to their loved one, and secure some compensation for their emotional losses.